The silver in this exhibit is not properly classified as "souvenir spoons". It is being presented here because the style which developed was very important in the two decades before the great souvenir spoon movement and this style gradually mutated into Art Nuevo which we know was used repeatedly in the souvenir spoon movement of the 1890's. American Admiral Matthew Calbraith Perry sailed into Tokyo Bay, Japan on July 8, 1853 and "exposed" the world to the fascinating "hermit kingdom". The Japanese had refused entry to previous European ships because of distrust stemming from the European colonization of China. The opening of Japan to world trade by the treaty of Yokahama is considered to be one of history's most important diplomatic achievements. In the 1870's through the 1880's, America became fascinated with the ancient culture of Japan and its emphasis on flora and bird forms. Edward C. Moore, the chief designer for Tiffany & Co., became the primary force in bringing Americanized Japanese designs to the upscale silver market in the United States and eventually Europe. This very influential designer produced dozens of unique and unusual designs which are still regarded with awe. 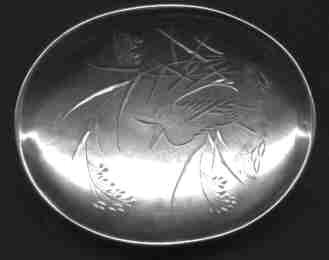 Of course, the designs were also picked up by other important silversmiths and Japan also began exporting silver to the American market. Japanesque designs from this era are also found on furniture and other objects. William Hood et al have released their new book, 'Tiffany Silver Flatware 1845-1905 When Dining Was an Art". I have acquired a copy and have found it to be fascinating reading. The photography is excellent, and there are many stupendous pieces shown. I have learned a great deal about Tiffany flatware although they have skipped all of the Tiffany souvenir spoons --which of course in my humble opinion is a mistake :-)--. The text is well researched, documented and clearly presented (although at times it is a little verbose). If you are interested in very expensive museum quality Tiffany flatware, this is a great book to buy ( It is rather expensive but if you can afford the flatware, then you can afford the book). Sometimes when collecting silver, the researcher becomes frustrated because all available documentation seems to ignore the piece in question. Many years ago I acquired this very interesting knife which was marked as being made by Tiffany. The standard reference books which I used all failed to describe this pattern, and I just set the piece aside for several years. In the September, 1999 issue of Silver Magazine, William P. Hood et al wrote an article about Tiffany Vine Pattern. Apparently they had the same problems which I encountered. None of the reference books which they used described this pattern and in fact Tiffany's own archives just added to their frustration. But these researchers continued and have added an important piece of information to silver history. Their research indicates that Tiffany's chief designer, Edward C. Moore, patented this Japanesque design pattern in 1871. Further research has indicated that the vine motif's included thirteen different plant forms. The gourd was one of the rarest of these very rare patterns. They have a picture of a spoon in "gourd" pattern in their article. According to the article, "Some of the die-stamped designs on Vine flatware (e.g., gourds on the vine) were models for applied designs on some of Tiffany's most spectacular Japanesque holloware." "Vine is scarce and expensive in today's antique market. Only select dealers usually handle it. About twice a year the major New York auction houses will have a few pieces to sell. Knives, especially dinner knives, are almost non-existent. Dinner forks are hardly less common. Of the various design motifs, grapevine is the one most often found. Peapod and Daisy are rare, and Wheat is very rare." 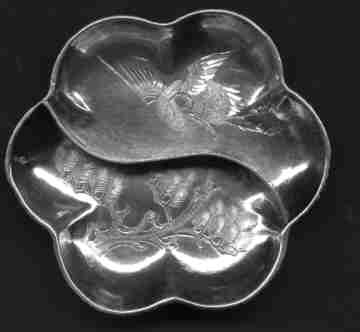 left: Tablespoon was produced by J.R. Wendt & Co., New York. This very unusual looking spoon is only marked "sterling", thus we do not know who manufactured it. The shape of the bowl and the engraved design on the handle and in the bowl tell us that it was made in the Japonais style. I am particularly intrigued by the unusual shape of the bowl. The handle top looks like some type of vegetable to me. Unusual spoon engraved as being from Nagasaki. The bowl has a "pumpkin like" quality. Japanese marks. Spoons similar to this were produced in England ca. 1824 and were classified as "nineteenth century Rococo Revival". I do not know the age of this spoon, but many of the recoco revival pieces are similar to the Japanesque. Of course, who would understand the Japanese style better than the Japanese? Some top Japanese firms began exporting silver to the upscale American market. These pieces were often imported by the top American manufacturers (Tiffany, Gorham etc.) and sold in their retail outlets. The Japanese made pieces usually exhibit very fine silverwork quality. The Americanization style of Japanesque is more desired than the Japanese version. (ie. the copy is more desired than the original--even though the copy is based upon Chinese figures rather than Japanese figures). 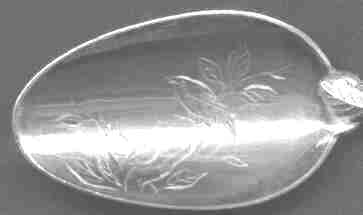 This very unusual handmade unmarked spoon with twig, bird and leaf elements also features partial gilding on the lower leaf, the bird in the middle of the stem and the engraving in the bowl (see below). I tried to reproduce it in color, but there was so much color smearing from the scanner, that I only did it in b&w. Oval shaped condiment dish on a ring base (Japanese markings). Note I have two extra of these if you wish to buy or trade. This spoon has an interesting fantailed turtle hand die stamped onto the handle with oriental characters above. This long spoon measures almost 8.7" and is very heavy. 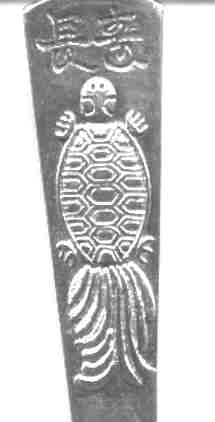 The Hood, "Tiffany Silver Flatware" book, shows similar spoons in this style and also discusses Terrapin delicacies. Terrapin was considered a delicacy during the 1870-1880's (when this spoon was made) and was only available to the very very wealthy. I suspect that this was a server spoon or a turtle soup spoon, but it would be difficult to eat with a spoon of this size. Isao Hoshino, an expert on Japanese turtles, wrote to tell me about this design. He says that this particular turtle design is an imaginary turtle which is a symbol of "long life" and is patterned on the Asian Brown Pond Turtle. In Japan this creature is known as a MINO ( a mino is an old raincoat made of straw, and the shell on this turtle design apparently reminds people of this raincoat). I have several more of these rare unusual spoons, but only need one for my collection. If you would like to buy or trade for this spoon, please send me an email. Hand made three tine fork with Japanesque handle engravings. Note the rather crudely done cutouts on the tines. Most work of this nature is better quality. This large 9.9" cake server is in the "Japanese Taste". In the closeup picture of the finial, note the small "fly" in the left corner. Bugs on flatware are quite rare. 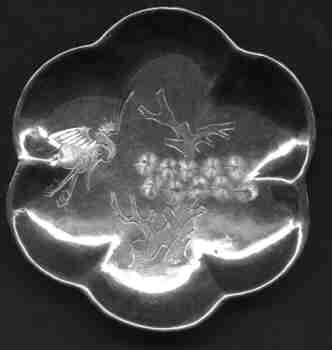 The bowl which you can't see because of the reflection has a delicately etched flower on it. This piece was made by Reed and Barton and is marked with the number "4". It is not marked sterling so I am assuming that it is silver plated.